As all of us have heard and read, the US plans to veto the Palestinian bid for statehood recognition in the UN. I am not surprised. The US has always been a supporter human rights and civil movements, but only when these take place in countries where there is oil, gold or other resources. So just by looking at the US's plan to veto this bid does not say much. During the 2008-2009 attack by Israeli forces on Gaza strip, the US took a "neutral" approach by not suggesting any sanctions against the Israeli state. Then came the attack and hostage-taking of the freedom Flottila vessel. And the case of building of new settlements in illegally captured territory is a whole different case all together. As mentioned earlier, it is no surprise that the US will veto the Palestinian bid. What is ridiculous is that the US suggests that this problem should be resolved by the Palestinian Government and the Government of Israel by holding bilateral negotiations. Why wasn't the National Transition Council of Libya asked to negotiate with the Gaddafi regime? Because they were offering a great chunk of oil resources of Libya? Barak Obama said during his policy speeches that two nations based on the 1967 borders are the only solution to this problem. How are you going to implement that plan, Mr. President? Breaking News can be scary! You get up and switch on your TV and the first thing you read is "Osama bin Laden dead" or "Islamabad under terrorist attack". 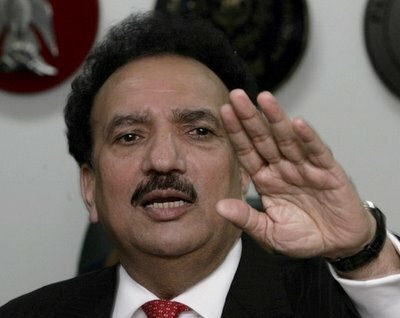 But nothing can be more scary and funny at the same time, then Dr. Ishrat ul Ebad's decision to confer a Doctorate degree to Senator Rehman Malik. I mean had it been a Masters in Fashion degree, it would have made sense given Mr. Malik's pink ties and matching "rumals". But a honorary Doctorate degree from Karachi University to a man who attributed the target killings in Karachi to wives and girlfriends is a bit of an overstretch. Governor saab should reconsider his decision and that too quickly, before this becomes a trend and such degrees are given out to Wasi Zafar, Meera and Amir Liaqat! In an interesting turn of events last night, when the US Navy seals returned to pick up their "malfunctioning" helicopter, WMD from Iraq were found in the same compound, where Osama Bin Laden was shot dead. The operation that lasted 44 minutes saw yet another mystery being solved by the CIA led covert operation. A boasting president Obama, addressed the media from the White House 85th time this month, saying clearly that America can do whatever it wants to. To a question about how the origin of these weapons was determined, Obama replied: "These are the WMDs from Iraq, we had them DNA tested." To another question regarding the footage from this operation Obama replied: "You cant take pictures of WMDs, they'll explode." The people living in the locality were stunned to see the return of the Navy seal helicopters. The question of Pakistan's sovereignty has risen once again. The Air chief replied to this question by sayin: "We had set our alarms at 45 minutes from the time the airspace was violated, it was lucky for them that they went back in 44 minutes." Zaid Hamid, a Pakistani TV analyst was of the view, "It is ridiculous to call these WMDs from Iraq, these were kept as cooking fuels as there was no gas in Abbottabad." Former US President George Bush commented on the story, "I told you Iraq had WMDs. They must have transported them to Pakistan when we raided Iraq. It is safe to say that both wars started in my era were legit." Why I dislike the increase in prices? Ask any freshman Economics student and he will tell you that the increase in prices is needed for the the supply to meet the demand. It is essential for the smooth working of the economy. Why then do I disagree with government of Pakistan when they increase fuel and commodity prices and taxes. As pointed out above, the increase in prices bridge the gap between demand and supply. But in Pakistan, even when the prices skyrocket, the goods are often not available. This is a seasonal effect. In winter, the price of sugar starts rising and it almost doubles. This, the government says, is due to shortage of the sugar available. But then, even when the market is full of sugar, the prices dont go down, which confuses the best of economists. Moreover, for the past two years, the word CIRCULAR DEBT(CD) featured many times in the news bulletins. This means the prices at which the government provides electricity is lower than the cost the government incurs when it produces it. So in order to end this CD, the prices needed to rise. So we saw first an increase of 6%, then 12% and then a subsequent 6%. Now the government talks about raising the tariff a further 1%. What is surprising is that the CD is still there and has not been reduced significantly, where as we are paying almost double of what we paid two years ago for a unit of electricity! Furthermore, the government has been pushed by IMF to increase tax revenue. What the IMF meant was to broaden the tax base, but the government has opted for the easier solution. FLOOD TAX! A new tax on the existing tax payers. ( There is some talk of widening the tax base but I wont believe it until it is actually done.) I would not have objected to this Flood Tax, had it been the case, that enough tax had been collected to run the economy. But all I see, is the government running off to IMF to secure more tranches of the loans. There is no plan as to the repayments of these loans, they are just rising. $53b the last time I checked. There is no explaination as to what has been done with the petroleum levy (previously known as carbon tax)? So unless there is any sign of the economy improving, i will keep disliking the rise in prices and taxes.